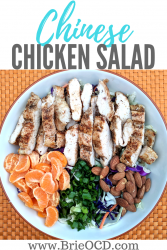 This Chinese Chicken Salad is refreshing, crunchy and protein packed! I was inspired by a recipe I saw in Cooking Light but decided to switch it up a bit and make it easier and healthier. This recipe has 425 calories, 24g carbs, 14g fat (healthy fats from the almonds!) and 51g of protein!! If you would like to reduce the carbs you can take out some cabbage and some mandarin oranges. If you want to reduce the fat, just remove half of the almonds. I cooked 2# of chicken which yielded 22oz ounces cooked. 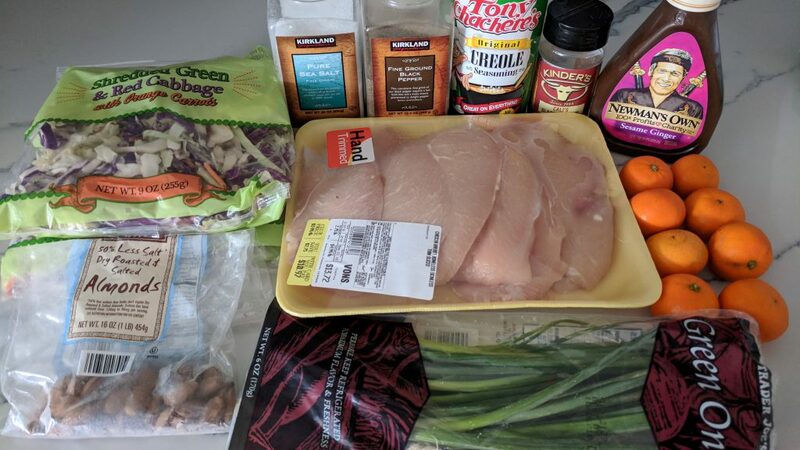 I put approximately 6oz of grilled chicken in each salad, however you can customize to your macros. You can also cook the chicken using your favorite method. On the grill, on a grill pan, in the crock-pot, instant pot or even buy a rotisserie chicken! The key is to just cook a bunch in advance so it takes less than 5 minutes to throw together! I used Newman’s Own Sesame Ginger Dressing because the stats were the best of all that I saw at the market. Per 2 tbsp there is only 1.5g fat, 35 calories and 5g of carbs. That is pretty darn good!! 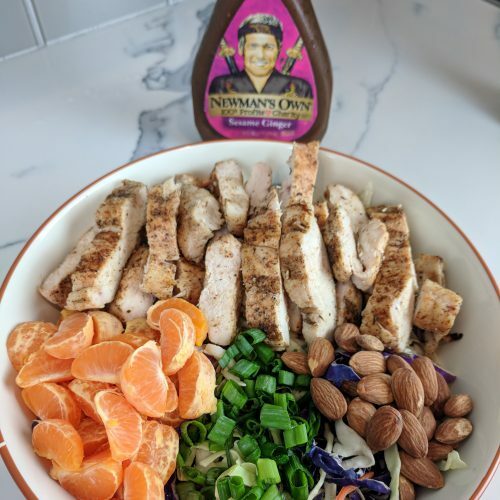 Newman’s Own dressing isn’t gluten-free but have no fear, you can use the Walden Farms Sesame Ginger OR Annie’s and you will be good to go! Vegetarians just leave out the chicken! This salad will still be delicious, just lacking protein. heat grill to 375 degrees. 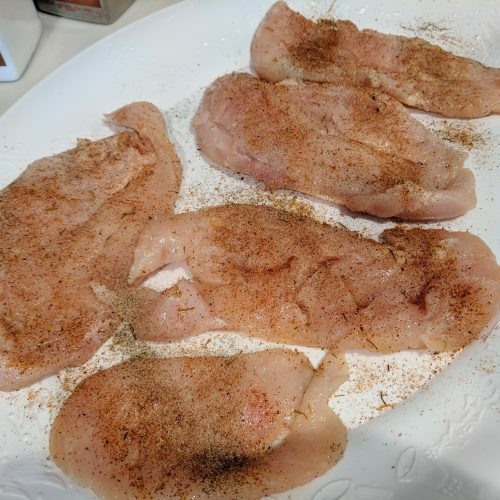 lightly season chicken breasts with salt, pepper, creole and blackening seasoning. 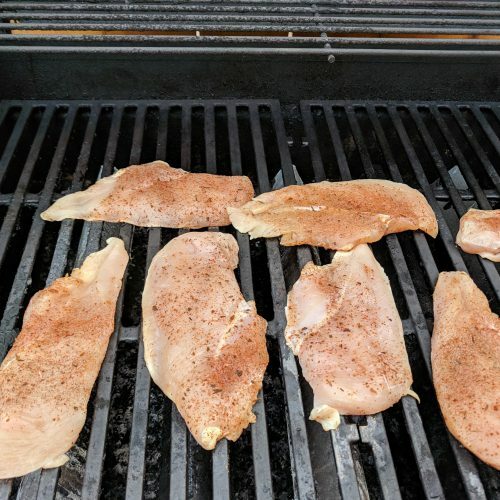 grill chicken for approximately 7 minutes or until internal temp reaches 165 degrees. Flip halfway through. while chicken is grilling, peel oranges and slice onions and start making salads. 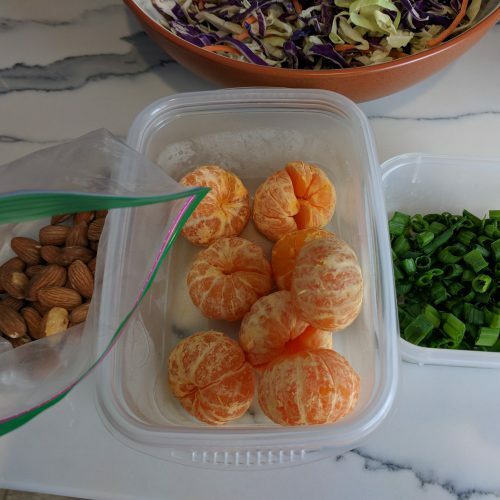 Place 2 cups cabbage in each bowl and top with 1-2 cuties, 12 almonds and 1 green onion. 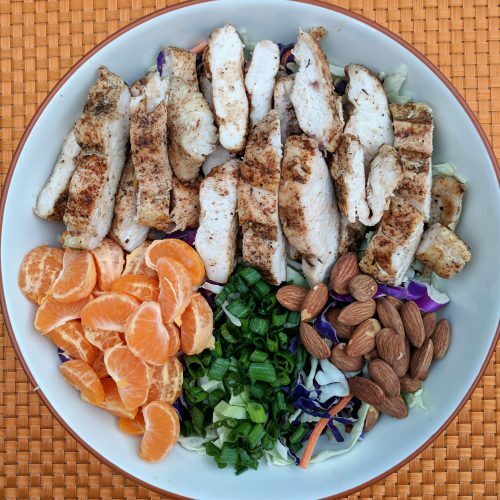 slice chicken and add to salad bowls. Top with 2 tbsp of sesame ginger dressing. Enjoy!